The majority of the site (89%) is a statutory Nature Reserve. 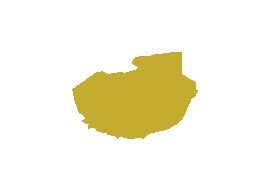 This was established on 28th September 1987. The site was designated as SAC in 1997. There are many noteworthy features, clues to our ancient past, in the immediate area surrounding the bog – everything from castles to forts to churches and burial grounds and even a Holy Well. The old 6 inch maps indicates a ring fort termed Raheenmore, just south of the site boundary. The remains of ringfort (max. int. diam. NE-SW c. 43m) is in the townland of Puttaghan (Phillipstown Lower) situated on W end of a large flat ridge and defined in part only from SW to NNE. According to the National Inventory of Architectural Heritage, it was quarried at W and levelled from SE to SW. 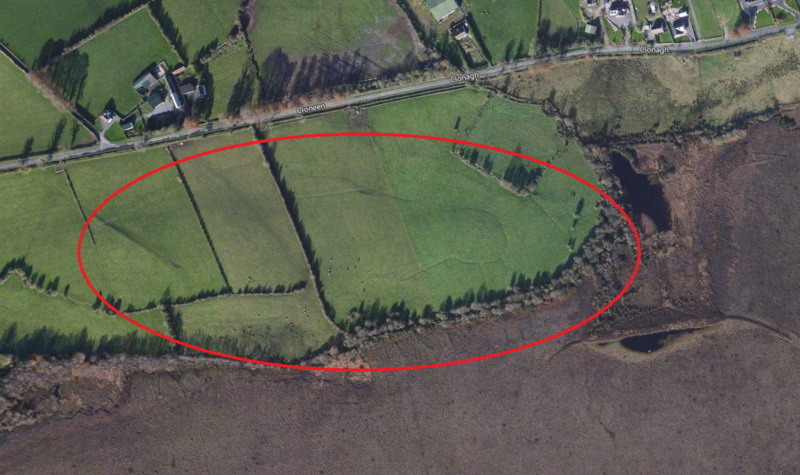 There is evidence of a ringfort or enclosure along the top of the bog in the townland of Cloneen and possible conjoined enclosures which appear in aeriel photos as a slight natural rise with a barely discernible ditch at east and south, which is partially a modern field boundary. The site is of doubtful antiquity despite aerial photographs showing conjoined enclosures. At Kilclonfert to the immediate west of the bog is the poorly preserved remains of an early medieval church built with large blocks of limestone, and below it, a castle. Only the south wall of the church stands to any height above foundations and it contains a small early medieval window with an inner rounded arch and an external pointed one. In the centre of the graveyard, are the ruins of a long rectangular church of which the S wall is the best preserved with a tower house nearby. The small triangular headed window visible on the centre of the south wall is possibly of Romanesque date. The base of this window is stepped. The walls are constructed from large blocks of limestone which are coursed and interspersed with red sandstone blocks. No doorway or other architectural features visible. To the immediate south of the church, on a low natural rise, are the remains of grass covered wall footings of a destroyed castle which may represent a tower house from the sixteenth century. It is possible to estimate that the tower house had internal dimensions measuring approximately 10m E-W by 9m N-S. There may have been corner towers on the SW and NE corners. There are remains of a rectangular shaped bawn to the S of the tower house. To the north of this enclosure there is a low bank which adjoins the graveyard wall and runs out in an E direction to form a roadway or laneway of unknown date and origin. Depicted as a small mound on all editions of the OS 6-inch map, and located 180m north of Kilconfert Church and Castle, there is a possible burial mound or barrow. It is now levelled and is not visible at ground level. 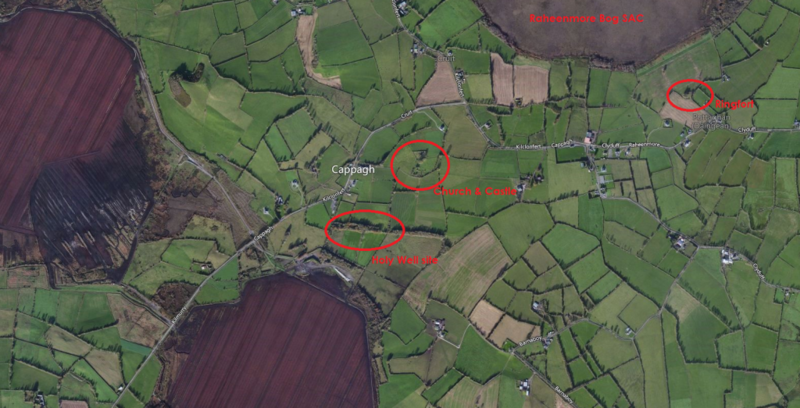 Further ringforts and enclosures appear in the nearby townlands of Monasset, Cruit, Mullagharush. What is classified by the National Monuments Service as a Ritual site and Holy Well is located in a ditch in the townland of Kilclonfert, just a field south of the church and castle. It is located behind St Coleman’s National School. The Holy Well site, with Church & Castle for reference. Below are the results of peat harvesting on what would have been adjoining Raised Bogs to Raheenmore. The above description is derived from the published ‘Archaeological Inventory of County Offaly’ (Dublin: Stationery Office, 1997). In certain instances the entries have been revised and updated in the light of recent research. The 1656 Down Survey parish map of Rahugh shows a tower house type castle standing on top of a small hillock. On this map the lands of ‘Monrath and Monasett’ belonged to ‘Art Mc Hugh Geoghan [Geoghegan], Thomas Geoghan and Conly Keegan’ who are described as Irish papists. Only the north-east and south-west SW angles of this poorly preserved rectangular tower house roughly aligned north-south survives upstanding. The above description is derived from the published ‘Archaeological Inventory of County Offaly’ (Dublin: Stationery Office, 1997). Kilduff House, an historic country house built in 1770 – 1780, is located to the East of the bog. 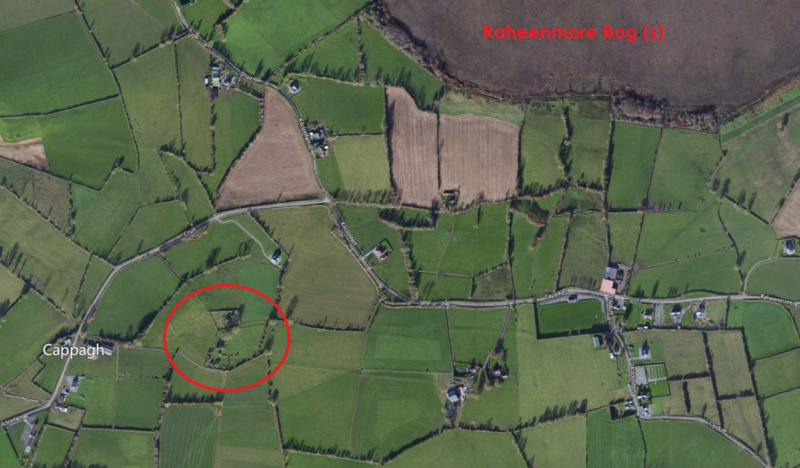 In 1959, the rare Ranoch-rush (Scheuchzeria palustris) was transplanted to Raheenmore Bog from the nearby Pollagh Bog, owing to the forthcoming excavation of the latter site by Bord na Mona. This plant is now absent from Raheenmore Bog and is extinct in Ireland. The past use of Raheenmore Bog was primarily for the extraction of peat. Surface and peripheral drains were dug, the majority of the surface drains are on the eastern boundary. Some of these were cut 100-150 years ago. Drains were indicated on OS maps of 1838, with further drains appearing on the 1910 maps. These were mostly infilled with Sphagnum species, but are still a focus point for water flow. The margins of Raheenmore Bog have largely been cutover. 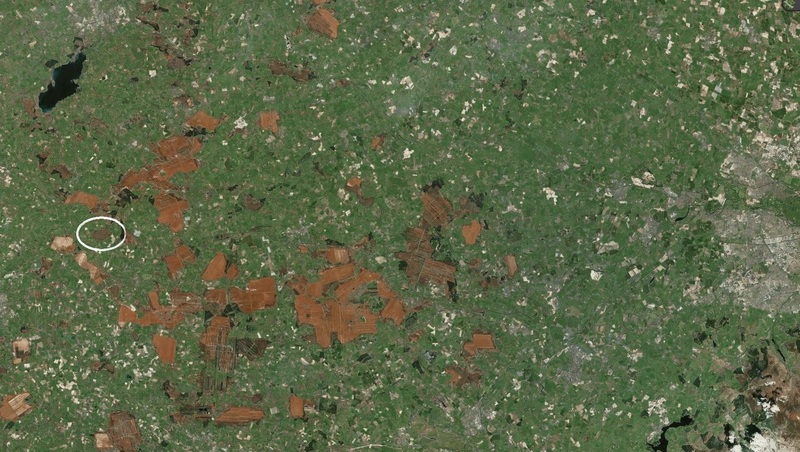 Peat cutting was concentrated in marginal areas to the southeast and north-west. The width of the cutover varies between 30-300m. The depth to which the peat has been extracted varies as well and is among other factors dependent on the depth of the mineral subsoil. At present, the marginal facebank is 1.5 to 4.0m above the peat surface in the cutover. Peat cutting has now ceased and most of the surface drains have been blocked. In 1992, a marginal area to the west was reclaimed, with the clearing of scrub and the digging of drains. During 1992, a marginal area to the west was reclaimed, with the clearing of scrub and the digging of drains. This affected the marginal vegetation communities in these areas. Research and monitoring of the bog and the restoration measures, are other on-going activities associated with conservation management, have been ongoing at Raheenmore for well over 50 years. It was been selected as one of the main locations for international, multidisciplinary studies of raised bogs, and many of these are collected on the National Parks and Wildlife Service (NPWS) website HERE. Measurements are recorded with regard to phreatic, piezometric, precipitation, evapotranspiration, discharge, groundwater, hydraulic conductivities and organic matter volume fraction levels. There has been a small downside to the ongoing research over the years. There are signs of trampling damage from access ways to monitoring instruments, which can be observed on aerial photographs and on the ground in the increased occurrence of White Beak-sedge.